1-2-3 Stitch! – Offering cross stitch, crochet, needlepoint, rubber stamps, and scrapbooking. Includes a newsletter and message board. 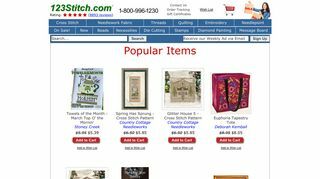 – Offering cross stitch, crochet, needlepoint, rubber stamps, and scrapbooking. Includes a newsletter and message board.